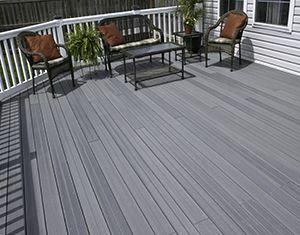 The deck construction services provided by MR. FIX-IT™ in Richmond, Virginia, are perfect for homeowners that want beautiful, weather-resistant decks that will stand the test of time. Our decks are made using TAMKO EverGrain deck boards, which are made of laminated polymer and wood composite that provides the look of all-natural wood without any of its frailties. As a result of their sophisticated construction, our decks are highly resistant to insect infestation, and will never rot or become waterlogged. What’s more, our boards feature built-in color, so they’ll never have to be primed or repainted, ensuring that our deck construction materials are as low-maintenance as they are durable. When you turn to MR. FIX-IT™ for deck construction, you can also count on exceptional service from our highly professional technicians. So exceptional, in fact, that we’ll back all of our work with a 20-year limited warranty that covers rotting, termite damage, and splintering, as well as five-year full-start period that covers all of the above as well as the cost of our labor. If you’d like to know more about the deck construction services we can provide for your home in Richmond, VA, or any neighboring community, contact MR. FIX-IT™ today.